Zhenjiang is at the south bank of the yangtze river in jiangsu province. zhenjiang used to be am important trade port along the grand canal from beijing to hangzhou. the completion of the canal was a major factor for the city&apos;s rise. the city&apos;s role in history declined gradually after that magical trade line fell into disuse. in recent years, the city has been making a come back economically. high rises and big boulevards are rapid entering the city. while the concrete buildings and skyscrapers present a modern zhenjiang, some of the city&apos;s remaining ancient land marks remind visitors of the old zhenjiang. 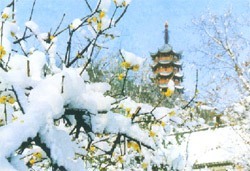 Zhenjiang has become a popular tourist destination in recent years. although it is still a major tourist draw for the chinese visitors, the fertile neighboring areas with flowing rice fields, abundant rivers will provide a feeling of refreshing and relaxation. Zhenjiang is in the north part of the subtropical monsoon zone, with seasonal weather condition. the annual temperature is about 15.4 centigrade. the best time to visit zhenjiang is spring and autumn when the weather condition is the most comfortable, high season price do apply, however. airplanes: There is no airport in zhenjiang, visitors have to transfer from the nearby cities nanjing or shanghai. Bus: Zhenjiang has a comprehensive road transportation network. the city has four long-distance bus stations and there are regular buses to nanjing, shanghai, suzhou and wuxi. Local Transportation: Zhenjiang is a small city with good public transportation. taxis are plentiful in the city and the flag down price is 7 yuan. Most hotels in zhenjiang cluster in the area from the railway station to dashikou with budget accommodation the majority. for luxurious lodgings, the international hotel and zhenjiang hotel(both 4 star) are good choices. Zhenjiang food belongs to the huainan cuisine, one of major eight cuisine schools in china. it&apos;s known for its tenderness, lightness and freshness. braising, stewing, roasting are the main cooking methods of zhenjiang food. the famous zhenjiang food include xierou shizitou( steamed crabmeat), braised chub, crab dumplings and much more. In and around zhenjiang, travelers can find the beigu hill and the numerous cultural relics scattering around everywhere in that hill. most of those cultural heritage can be traced back to the three kindoms period, thousands of years ago. jinshan or golden hill is another highlight in the city. the jinshan temple in that hill is associated with the famous legend" the story of the white snake".